Installing rooftop solar panels should be an easy decision for customers looking to lower their electric bills and reduce their reliance on fossil fuels. Net-metering and generous tax credits have made it more affordable than ever for homeowners to install panels and reap the financial benefits of going green. Unfortunately, the deceptive tactics of solar companies have made rooftop solar a bad bet for now. Campaign for Accountability’s (CfA) year-long investigation into the rooftop solar industry has revealed promises of clean energy at reduced cost have proven deceptive. Unscrupulous actors have exploited vulnerable populations, preying on the elderly and those on fixed-incomes. Companies have misled consumers about the true costs of installing solar panels, provided shoddy craftsmanship, and left homeowners with higher utility costs, all while forcing them to sign unconscionable contracts that leave little possibility of recourse. Two companies in particular stand out: Vivint and SolarCity. Complaints against these two – among the largest providers – constituted nearly 56 percent of all the complaints consumers filed with the FTC about solar companies. Among other things, consumers reported poor customer service and being tricked into buying solar panels. After reviewing thousands of consumer complaints about these and other companies, CfA asked state and federal authorities to investigate the industry’s conduct with particular attention to Vivint and SolarCity. The Securities and Exchange Commission (SEC) has opened an investigation, and state attorneys general are actively monitoring the industry. The adoption of rooftop solar panels has grown dramatically in recent years as more consumers have purchased or leased solar panels for their rooftops. Due to this rapid growth, in 2016 the Federal Trade Commission (FTC) hosted a public workshop to shine a light on consumer protection issues stemming from rooftop solar. Panelists from Consumers Union and the Massachusetts Attorney General’s Office, for instance, discussed problems such as contracts that contain confusing wording about energy tax credits, consumers unable to sell or buy homes once solar panels have been installed, and promises of savings on utility bills that fail to materialize. Last fall, CfA launched an investigation into the issues raised by Public Citizen and NCLC, submitting open records requests in a number of states, as well as to the FTC and CFPB, seeking complaints about the sale or leasing of residential rooftop solar panels. CfA’s review found that American consumers identified numerous companies that provided poor or inadequate service, falsely represented the savings the customers would realize from solar power, lured them in with low price quotes that later proved to be false, required them to sign confusing contracts, and/or performed shoddy installation of the solar panels. The FTC reported that consumer complaints about solar companies increased seven-fold between 2012 and 2016. Customers of Vivint Solar, for instance, complained to the California Attorney General about the company’s false promises and misleading sales offers. One reported being promised savings of 20-30 percent on their electric bill, but after solar panels were installed, the bill actually increased by 80 percent the first month and 100 percent the second month. Another Vivint customer complained of signing up for solar energy under false pretenses after the company misrepresented itself as affiliated with a utility company. The consumer sought unsuccessfully to have the solar panels removed, but the company stopped returning her calls. Vivint’s troubling business practices have drawn the scrutiny of consumer protection agencies across the country. The Better Business Bureau (BBB), which has not accredited Vivint, has received 522 complaints against the company since 2015. 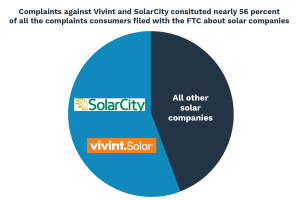 Since, 2012, the FTC has received 34 complaints specifically about Vivint’s solar panel business. While Vivint Solar has been a distinct entity since 2014, previously it and Vivant Security were divisions of the Blackstone conglomerate. The home security division has been particularly problematic for customers: the FTC has received roughly 950 complaints about it since 2012, and state attorneys general have reached settlements with the company resulting in hundreds of thousands of dollars in fines and restitution and changes in its business practices. SolarCity customers also have reported numerous problems with the company. Consumers have filed 671 complaints against the company with the BBB since 2015, and 118 complaints with the FTC since 2012. Numerous complaints also have been filed with state authorities. Typical is one filed by an Oregon consumer who complained that that SolarCity repeatedly told him the maximum amount he would ever be charged per month was $76.63. In fact, he was, charged an additional $75/month to prepay the cost of an Oregon tax credit. Another SolarCity customer reported that his monthly bill was nearly double what the company had promised. He reported that he maintained his current energy usage, but SolarCity wanted to charge him for what it claimed was his additional energy use. After reviewing thousands of consumer complaints, CfA asked four state attorneys general and the FTC to investigate the deceptive sales and marketing practices of the solar industry. CfA also published editorials in state and local newspapers calling for greater accountability of the solar industry and alerting homeowners about the industry’s problems. Additionally, other public interest organizations are taking notice. In July 2017, the Consumer Federation of America released its annual report, “Nation’s Top Ten Consumer Complaints 2016,” which flagged problems with solar energy sales as an “issue to watch” for consumers. The report warned consumers about shoddy solar contractors and problematic leasing arrangements, highlighting, for example, a Maryland complaint regarding an 84-year-old man who had been induced to sign a 20-year lease for solar panels. Attorneys general are also taking steps to protect consumers from rooftop solar companies. In May, the Attorney General of Mississippi issued a guide to protect consumers that buy solar panels after acknowledging the problems experienced by consumers in surrounding states. Attorneys general in Massachusetts and Louisiana have issued similar warnings, urging consumers to tread carefully when purchasing rooftop solar panels. CfA has also worked to hold the industry’s public relations representatives accountable, publishing a report in June exposing the Energy and Policy Institute (EPI) – an organization that describes itself as both a watchdog and a think tank – as the apparent project of a for-profit public relations firm. CfA’s report explained that EPI, which claims it “exposes attacks on clean-energy,” is just as secretive as the organizations it claims to expose. The institute does not disclose its annual tax return; it has no an address beyond a post office box; its few employees appear to be scattered across the country; it is not registered with any relevant Secretary of State’s office; and it does not release the names of any board members. While clearly a front group for the solar industry, EPI is accorded expert status by even the most prestigious news organizations, while failing to note its obvious affiliation. The unfortunate reality of government action is that regulators are slow to react to new and emerging technologies. As rooftop solar has grown dramatically, so have the deceptive schemes and bad actors shilling for it. State attorneys general and the FTC have been receiving complaints about these companies like SolarCity and Vivint Solar for years, but have been slow to hold them accountable. As the FTC’s own workshop demonstrated, the abuse by rooftop solar companies is real and extensive. Regulators finally appear to be acknowledging the industry’s problems. Government officials must remain vigilant, though, to ensure American consumers are protected from the snake-oil salesmen of the twenty-first century. Ivan Penn, Rooftop Solar Installations Rising but Pace of Growth Falls, Los Angeles Times, March 15, 2017, available at http://www.latimes.com/business/la-fi-rooftop-solar-20170314-story.html. Something New Under the Sun: Competition & Consumer Protection Issues in Solar Energy, Federal Trade Commission, June 21, 2016, available at https://www.ftc.gov/news-events/events-calendar/2016/06/something-new-under-sun-competition-consumer-protection-issues. Workshop Transcript, Something New Under the Sun: Competition & Consumer Protection Issues in Solar Energy, Federal Trade Commission, at 4, June 21, 2016, available at https://www.ftc.gov/system/files/documents/public_events/943943/solar_workshop_transcript.pdf. Letter from Tyson Slocum, Energy Program Director, Public Citizen, to Edith Ramirez, Chairwoman, Federal Trade Commission, August 22, 2016, available at https://www.citizen.org/sites/default/files/federal-trade-commission-comments-solar-consumer-protections-august-2016.pdf. National Consumer Law Center, Comments to the Consumer Financial Protection Bureau regarding Arbitration Agreements, at 29, August 22, 2016, available at https://www.nclc.org/images/pdf/arbitration/comments-arbitration-agreements-2016.pdf. Letter from Anne Weismann, Executive Director of Campaign for Accountability, to Kamala Harris, Attorney General of California, November 17, 2016, available at https://campaignforaccountability.org/cfa-asks-california-attorney-general-to-investigate-solar-industry/. https://www.bbb.org/utah/business-reviews/solar-energy-contractors/vivint-solar-in-provo-ut-22302389/reviews-and-complaints (last visited on December 5, 2017). The FTC released a total of 1,219 complaints in response to CfA’s Freedom of Information Act (FOIA) request for complaints pertaining to the sale or leasing of solar panels and their installation on the roofs of customers’ homes from 2012 to the present. See Letter from Daniel Stevens, Executive Director of Campaign for Accountability, to Thomas B. Pahl, Acting Director of the Bureau of Consumer Protection at the Federal Trade Commission, July 19, 2019, available at https://campaignforaccountability.org/cfa-calls-on-ftc-to-investigate-solar-industry/. Dana Mattioli, Blackstone Prepares for IPO or Sale of Vivint, Dow Jones Newswires, September 11, 2017, available at http://www.foxbusiness.com/features/2017/09/11/blackstone-prepares-for-ipo-or-sale-vivint.html. The FTC released complaints regarding Vivint’s home security division in response to CfA’s FOIA request for complaints regarding Vivint Solar. Anastasia Weckerly, Utah-Based Home Security Company Reaches Settlement with Commonwealth, NBC10, January 11, 2017, available at https://www.nbcphiladelphia.com/news/local/Utah-Based-Home-Security-Company-Reaches-Settlement-with-Commonwealth-410433655.html; Paul Muschick, Alarming Allegations Against Alarm Company, The Morning Call, September 5, 2015, available at http://www.mcall.com/news/local/watchdog/mc-vision-security-alarm-system-watchdog-20150905-column.html; Press Release, Vivint, Inc. to Pay $375,000 to Resolve Allegations of Deceptive Advertising and Sales Practices, Georgia Department of Law, Consumer Protection Unit, February 12, 2015, available at http://consumer.georgia.gov/news/press-releases/view/vivint-inc-to-pay-375-000-to-resolve-allegations-of-deceptive-advertising-and-sales-practices; Press Release, AG Files Enforcement Actions Against Home Security Companies, Office of the Attorney General of Ohio, September 9, 2013, available at http://www.ohioattorneygeneral.gov/Media/Newsletters/Consumer-Advocate/September-2013/AG-Files-Enforcement-Actions-Against-Home-Security. Letter from Daniel Stevens, Executive Director of Campaign for Accountability, to Ellen F. Rosenblum, Attorney General of Oregon, March 29, 2017, available at https://campaignforaccountability.org/cfa-asks-oregon-attorney-general-to-investigate-solar-industry/. https://www.bbb.org/greater-san-francisco/business-reviews/solar-energy-system-design-and-installation/solarcity-corporation-in-san-mateo-ca-187674/reviews-and-complaints (last visited December 5, 2017). Kirsten Grind, SEC Probes Solar Companies Over Disclosure of Customer Cancellations, The Wall Street Journal, May 3, 2017, available at https://www.wsj.com/articles/sec-probes-solar-companies-over-disclosure-of-customer-cancellations-1493803801. Press Release, Nation’s Top Ten Consumer Complaints 2016, Consumer Federation of America, July 27, 2017, available at http://consumerfed.org/press_release/nations-top-ten-consumer-complaints-2016/. Press Release, Attorney General Announces the Consumer Guide to Solar Power in Mississippi, Office of the Attorney General State of Mississippi, May 3, 2017, available at http://www.ago.state.ms.us/releases/attorney-general-announces-the-consumer-guide-to-solar-power-in-mississippi/. Press Release, AG Healey Offers Advice To Homeowners Considering Solar Panel Installations, Office of the Attorney General of Massachusetts, March 11, 2016, available at http://www.mass.gov/ago/news-and-updates/press-releases/2016/advice-to-homeowners-considering-solar-panels.html; Renita D. Young, Attorney General Buddy Caldwell Warns Against Solar Power System Costs, Scams, The Times-Picayune, April 24, 2015, available at http://www.nola.com/business/baton-rouge/index.ssf/2015/04/solar_power_system_scams_attorney_ general_buddy_caldwell.html; Steven Trader, Vt. Warns Against Deceptive Advertising Of Solar Energy; Law360, December 8, 2015, available at https://www.law360.com/articles/735573/vt-warns-against-deceptive-advertising-of-solar-energy. Hiroko Tabuchi, Rooftop Solar Dims Under Pressure From Utility Lobbyists, The New York Times, July 8, 2017, available at https://www.nytimes.com/2017/07/08/climate/rooftop-solar-panels-tax-credits-utility-companies-lobbying.html; Dino Grandoni, The Energy 202: Trump Administration Has New Energy Buzzword, The Washington Post, May 25, 2017, available at https://www.washingtonpost.com/news/powerpost/paloma/the-energy-202/2017/05/25/the-energy-202-trump-administration-has-new-energy-buzzword/5925c045e9b69b2fb981db8a/; Andrew Blum, Oil Won’t Last Forever, so Dubai is Betting Big on Science and Tech, Popular Science, May 15, 2017, available at https://www.popsci.com/dubai-science-tech-innovation.